The Serving Pets Outreach Team (SPOT) is dedicated to helping our community provide responsible care for their pets. 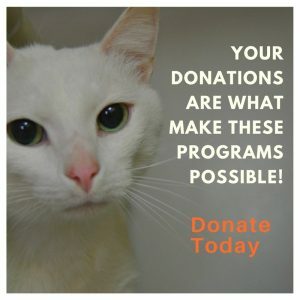 Established in 2009, the SPOT program provides a connection with the community that helps keep pets out of the shelter in the first place. With education about the benefits of spay/neuter and low-cost opportunities to make that happen, the population of unwanted pets is greatly reduced. Assistance with pet food, low-cost vaccines and other supplies enables residents to keep their loved pets in their home when they might otherwise be surrendered to the shelter. Education and help with more humane treatment of pets creates a stronger bond between pets and their guardians. Through these services, SPOT has helped to reduce the intake at the shelter by as much as 57% since 2009. If you believe in S.P.O.T.’s mission, please consider making a donation.